Amazon makes its own sound bar, and it’s actually pretty impressive. At just $75, the AmazonBasics 2.1 Channel Bluetooth Sound Bar with Built-In Subwoofer offers a whole lot of bang for your buck. 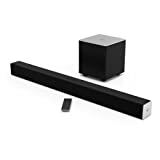 Even though Amazon makes and sells this sound bar itself, however, there’s actually another model that Amazon recommends buying even more than its own speaker. The VIZIO SB3821-C6 38-Inch 2.1 Channel Sound Bar with Wireless Subwoofer has received the coveted “Amazon’s Choice” designation in the sound bar category, and we don’t blame Amazon for admitting this model is better than its own. We’ve been using one for more than a year now, and we absolutely love it. It would still be a great value at double the price, but you’d probably rather save $10 in Amazon’s current sale instead.